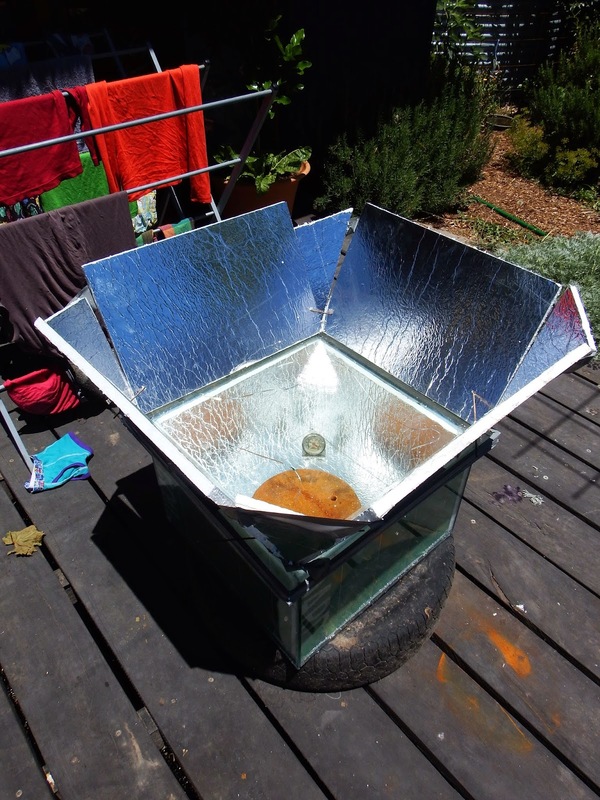 My mate Dylan and I have been talking about making a solar cooker for a year (or two) now and we finally made some time to put our ideas into action. Rather than stick to a standard design we decided to experiment a bit. There's basically two types of solar cookers. The box cooker and a parabolic reflectors. The box cooker is an insulated box with a transparent lid and light directed towards it. These are generally slow cookers, usually used for roasting or stewing. The parabolic cookers all work on the principle of reflecting light to a concentrated source. These are quick cookers - good for boiling water or a fry pan. We were wondering about the box cooker idea, but the box being made out of glass - to increase the amount of light and heat that it could collect. With the addition of reflectors we thought that theorised that the box would get pretty darn hot. 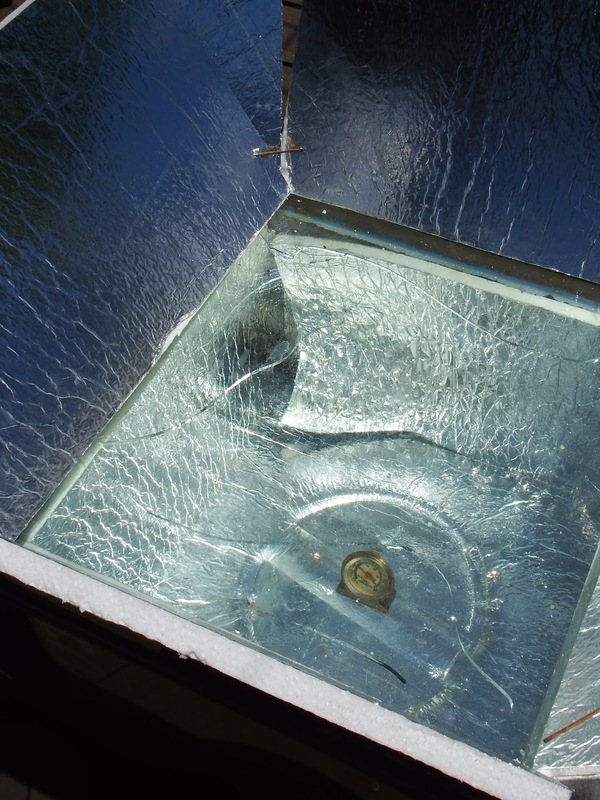 The original idea was to create a double glazed box and lid - to help keep the heat inside. 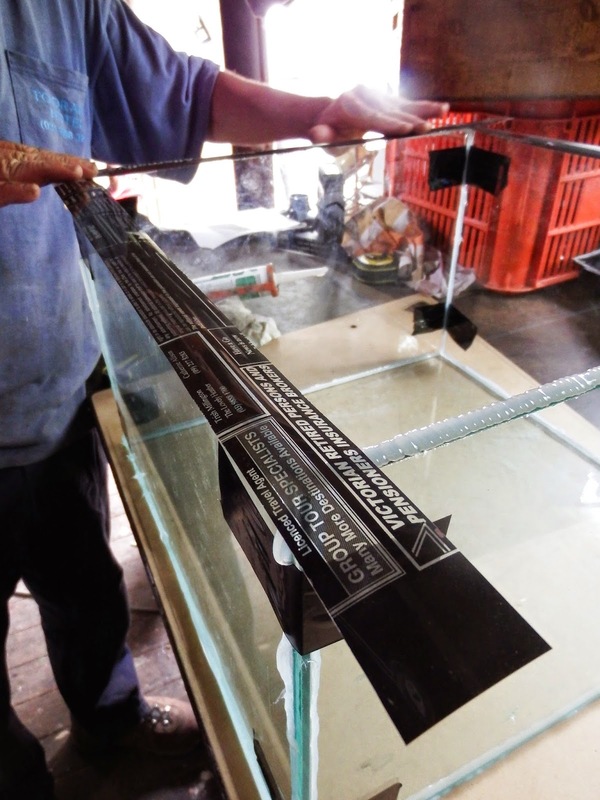 With our first prototype we created a single glazed box with a double glazed lid. Dylan, being a glazier, amongst other things was the right man for the job! We found a day to put our ideas into action. Making the box. Glass, silicon and tape - 460 x 460 x 300mm high. A bead of silicon is covered with acetate (silicon does not stick to acetate), and then a sheet of glass placed on top with a weight to create a flat surface and a reasonable seal. Acetate strips were removed when dry. The finished experimental box delivered to Abdallah House. Initial testing. The glass cube cooker with insulated polystyrene / foil lined walls (2 sides) and base with a 260mm dia x 40mm high steel plate for thermal mass. This example only got to about 55-60ºC at the base on a sunny day - which was similar to what it reached with no insulated sides. Second Test: Glass cube solar cooker with steel plate for mass, polystyrene with foil for the base (inside) and reflectors directing light / heat on the outside. The method reflected a lot more light into the cube and it got significantly hotter. With the thick steel plate in the base, and an enamel pot (red) with 1lt of water in it the box got to a maximum of 105º (about an hour after the suns zenith), measured at the bottom. The water got to 85ºC after 2 hours. Top temperature of 26ºC on a clear day. NOTE: These temperatures are not very accurate, and are measured from the bottom of the cube - the top would be considerably hotter. As a standard box cooker can get to 150ºC (not sure where measured from), these are not very impressive results. We probably need to set up a standard box cooker to compare. If the glass cube was double glazed I think that results would improve somewhat. Our feeling is that once it gets to a certain temperature inside the cube the single glazed glass cannot contain the heat. We decided to move more towards the box cooker idea to see how it would perform with insulated sides. The results were considerably better and pushed the limits of our choice of materials over the edge. The temperature readings were 110-120ºC at the base. The polystyrene deformed on the South-West side and base and the inside of the double glazed glass cracked. Now we have to put our heads together and find some time for stage two. Maybe in the new year? Suggest, for safett reasons, that you use toughened safety glass instead of plain 6mm glass. If your going the double glazed route (recommended), 4mm TSG should be fine and will reduce the weight of the unit. Also, suggest the base of your unit and your cooking pots are black - to absorb solar heat / sun's energy. Nice work guys, thanks. Interesting that model with insul on 2 sides didn't get much hotter than no insul sides. I suppose that indicates how readily the 2 uninsul sides increase their heat loss in response to higher internal temp. Mods you've probably thought of..
- insert a hardwood or plastic insulator under steel plate to protect polystyrene. - use clear comfort or similar plastic film to create dbl glz on sides. Not trying to put Dylan out of job, but it is cheaper.